Queensland University of Technology (QUT) researchers have found the habit of Googling for an online diagnosis before visiting the doctor can be a powerful predictor of infectious diseases outbreaks. 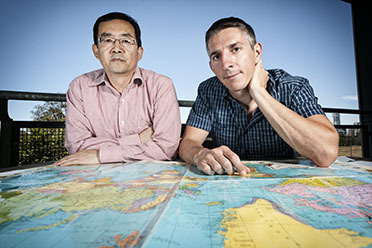 Now studies by the same Brisbane-based researchers show combining information from monitoring internet search metrics such as Baidu (China’s equivalent of Google), with a web-based infectious disease alert system from reported cases and environmental factors hold the key to improving early warning systems and reducing the deadly effects of dengue fever in China. Dr Wenbiao Hu, from QUT’s Institute of Health and Biomedical Innovation, has spent more than 20 years working in the area of public health and infectious diseases, and said early detection was vital to reducing the impact of infectious diseases. He has been working closely with Dr Gabriel Milinovich also based at QUT and Professor Archie Clements from the Australian National University. “Dengue fever is the most rapidly spreading vector-borne disease – with a 30-fold increase in global incidence over the past 50 years, and affects more than 50 million people annually,” Dr Hu said. “In China dengue fever has been a major public health concern since it re-emerged in Guangdong province in 1978 and there have been more than 650,000 cases reported since then. “Guangdong has seen a significant surge in dengue fever cases this year with already 42,856 reported. “What we have found through our research is that affected areas appear to have been expanding in Guangdong over recent years, which indicates potentially increasing risk for unaffected areas in other parts of Guangdong province. Working with the Chinese Centre for Disease Control and Prevention, QUT has tested the individual performance of internet-based surveillance, an automated dengue fever alert system and monitoring of environmental factors such as temperature, humidity and rainfall. “What we have found is that internet-based surveillance such as monitoring search engines like Baidu, could accurately predict outbreaks of infectious disease such as dengue fever up to a few weeks faster than traditional surveillance methods. Dr Hu said in addition the Chinese Centre of Disease Control and Prevention had developed the China Infectious Disease Automated-alert and Response System (CIDARS) that could accurately predict all reported outbreaks within three days of the first confirmed case. “Our studies have found the CIDARS achieved 99.8 per cent success in detecting dengue fever outbreaks in three days, but one of the limitations is it is difficult to predict dengue fever outbreaks before cases are diagnosed and reported. Dr Hu said the international nature of emerging infectious diseases combined with the globalisation of travel and trade, had increased the interconnectedness of all countries meaning detecting, monitoring and controlling these diseases was a global concern. The results of the studies have been published in a number of international journals. The latest paper published in PLOS One titled Evaluation of the Performance of a Dengue Outbreak Detection Tool for China is available here.